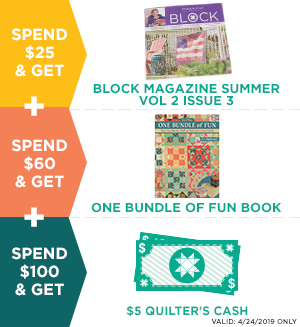 MSQC BLOCK Quilt Magazine — Missouri Star Quilt Co.
Each issue is only $7.99 for a total of $47.94 a year for six issues when you subscribe. Each issue is only $9.99 USD for a total of $59.94 USD a year for six issues. Plus, there's no additional shipping charge when you subscribe! BLOCK is published bi-monthly, in February, April, June, August, October, and December. You'll be billed at the end of the month prior to the publish months, and the new issue will be sent to you by the end of the publish month. Subscriptions auto-renew so you never miss an issue. If at any point you decide BLOCK isn't the magazine for you, simply login to your Missouri Star account and cancel your subscription or contact customer service.